In the 1920s, cities from New York to Paris experienced a dynamic social, artistic, and musical evolution. After witnessing the world’s First World War people were looking for a way to have fun and move forward. This era, known as the Roaring Twenties, forever redefined the way we approach fashion. Thanks to new technology, the world began paying an unprecedented amount of attention to celebrity culture and style. Unlike the conservative decades before the 1920’s, women were more open to taking fashion risks. Women began to wear shorter skirts, which flaunted legs and stylish women’s designer shoes for the first time. 1920's movie stars like Bessie Smith, Joan Crawford, and Clara Bow sported timeless styles and classic looks that are remembered up until now. The widespread use of radios brought smoky jazz music to the masses and made stars out of singers like Bessie Smith and Ethel Waters. Meanwhile, Hollywood film-making was on the rise, which led to the fame of actresses like Louise Brooks, Clara Bow, and Joan Crawford. Suddenly, stars were in the spotlight like never before – and so were their fashion choices. The flapper era was a game changing time for women. 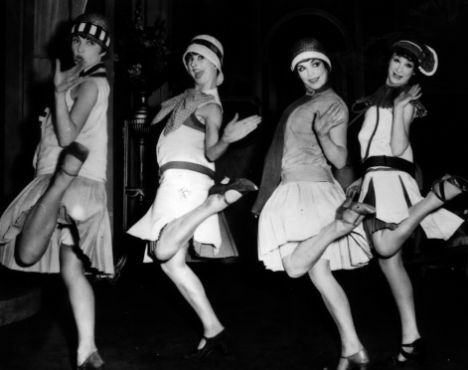 The Roaring Twenties may be best known as the flapper era. Flappers were young women who shed conventional societal restrictions by drinking, smoking, driving automobiles, and listening to jazz. They made bold fashion statements by sporting bobbed hair and short skirts with silk stockings and garter belts, while also creating striking makeup effects with kohl-rimmed eyes and painted bow lips. With prohibition in full swing, speakeasies began to emerge. Flappers would go to these underground clubs and dance the night away. The flapper’s radical look and lifestyle were accompanied by new innovations in women’s designer footwear. As dresses became flashier and more detailed, so did shoes. Designer shoes became more popular than ever before. Another famous shoe designer of the 1920’s was French native, André Perugia. Perugia understood the need for a woman’s shoe to be both fashionable and comfortable. He would associate the height of the heel to a woman’s body weight and even though the heels tended to be thicker for more support, they still included a stylish detail. A modern style that is similar to Perugia’s design is the Kate Spade Dijon Bow Pump Black. As the decade wore on, shoes remained stylish, but practical elements were added to maximize comfort and convenience. One example is the strap. Flappers who danced to lively jazz tunes all night wanted their shoes to stay on – and to stay comfortable. The most common strap styles were the T-Strap Shoes (or T-Bar Straps) and the Mary Jane. The T-Strap has a strap running from the center toe of the shoe to another horizontal strap that circles the ankle. The Cathy Platform Pump by Jeffery Campbell keeps the signature ankle strap style and thick heel associated with the 20’s, but adds a modern flare using a laser which etches a more detailed pattern. The Mary Jane shoe’s signature strap goes across the foot and clasp with either a buckle or button. The Chie Mihara Kinko D’Orsay Pump preserves this iconic strap style while adding a very modern toe cap. Though the decadence of the 1920s didn’t last forever, the fashion of the era has had a lasting influence on generations of fashionistas. We still revere the styles of the era and revisit them all the time – in fact, they will soon be seen again in an upcoming adaptation of the classic film The Great Gatsby. Nearly a century after it first arrived, the fashion of the twenties is still making a major splash.